During his nearly 40 years of experience with the National Park Service (NPS),Bob Stanton served as a seasonal park ranger, management assistant, park superintendent, deputy regional director, regional director, associate director, and director, giving him a perspective and depth of experience matched by few others. He was born in Fort Worth, Texas, and grew up in a small African American community in the Mosier Valley outside Fort Worth. His modest upbringing and his experiences early in life helped shape both his character and his career choices. He earned a bachelor of science degree from Huston-Tillotson University in 1963, the first in his immediate family to graduate from college. He later did graduate work at Boston University and George Washington University. Stanton’s career with the NPS began in 1962 when the secretary of the interior appointed him as a summer seasonal park ranger at Grand Teton National Park (NP) in Wyoming. In 1966 he accepted a full time position as a personnel management and public information specialist in NPS headquarters in Washington, D.C. Three years later, he became a management assistant at National Capital Parks-Central and then in 1970 became superintendent of Virgin Islands NP. In 1974 he took over as deputy regional director for the NPS Southeast Region in Atlanta and two years later returned to NPS headquarters as assistant director for park operations. Stanton then served eight years as deputy regional director for the NPS National Capital Region. After a year as associate director for operations in NPS headquarters, he returned to National Capital Region to become regional director in 1988 and served in that position until his retirement in January 1997. His retirement, however, was short-lived. The secretary of the interior asked him to return to serve as director of the NPS, the agency’s first African American director. Stanton would remain in that position until 2001. As director Stanton actively promoted greater diversity within the national park system, increased opportunities for young people, and enhanced NPS public programs to better serve minority populations. During his decade’s long distinguished career, Bob Stanton received three honorary doctorate degrees, and numerous awards, to include the department of the interior’s highest award, the Distinguished Service Award. 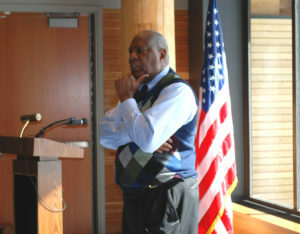 Though retired from the NPS, he continues to devote much of his time to various professional and civic affairs, serving in recent years as a leader in the Student Conservation Association, Inc., the National Audubon Society, Guest Services, Inc., and the African American Experience Fund of the National Park Foundation. He continues to promote his life-long interest in national parks and advancing opportunities for young people, making substantial contributions.